Why is my Vehicle Vibrating? 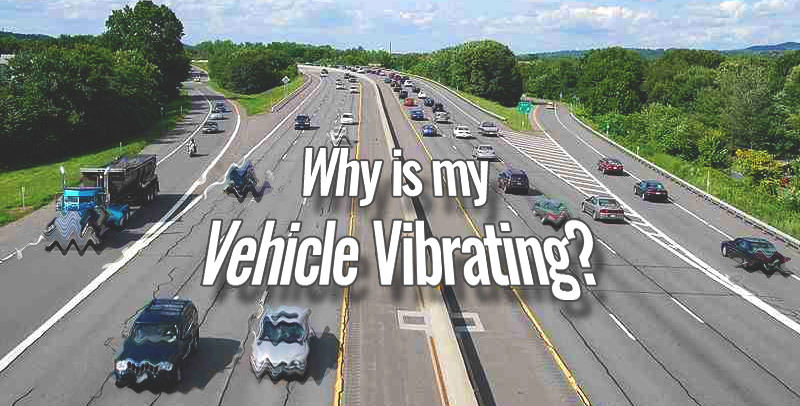 If you’ve been noticing a vibrating sensation when you drive and aren’t sure why, don’t worry. Many vibrations usually stem from common problems and can be easily fixed by a mechanic. However, if you don’t take your vehicle in immediately, you could be putting yourself at risk, as some issues are more dangerous than others. First things first, take a good look at your tires. A wobbly tire can often be the cause of the vibrations. Take your vehicle to a mechanic immediately if you find anything loose, as you’ll be putting yourself at significant risk otherwise. Despite looking fine to the eye, tires can still be improperly balanced. Not only can alignment issues cause vibrations, but they can also have a negative effect on fuel economy and safety. If the vibrating tends to get much worse on the highway or at accelerated speeds, that’s typically a solid sign that your tires aren’t equally balanced. To avoid this in the future, purchase a quality set of tires and remember to have them looked at when you go in for your routine maintenance checks. Hitting a pothole or curb may appear innocuous, but could end up turning into a serious complication. There may be a severe issue with the wheel, one that only a trained mechanic will be able to fix. Try to avoid unpaved roads. If this isn’t possible, at least make sure to drive at a slower speed so your car can better absorb the shock. Are the vibrations ever accompanied by a burning odour? If so, there may be an issue with the brake calipers. Just like with a misaligned wheel, the vibrations will get gradually worse the faster you go. It should go without saying, but make sure to take your car in immediately if you suspect there’s an issue with the calipers. To help diagnose the problem earlier, pay close attention to your brake pads. If one pad wears quicker than the others, it’s usually because of a shoddy caliper. This if often the worst case scenario, but still possible, especially if you’ve owned your vehicle for a long time. If the vibration is coupled with a loud noise, it usually means the problem is bigger than just the alignment or brake calipers. Unlike the previous issues, you should never continue to drive your car if you suspect there’s a problem with the transmission, even if it’s just to the mechanic. Instead, call to have your vehicle towed to the dealership instead. If you can’t diagnose the problem on your own, it’s best to take your car into a dealership to have a mechanic check it out. They’ll be able to properly diagnose the problem and they have all the specialized equipment required to do the job properly the first time.